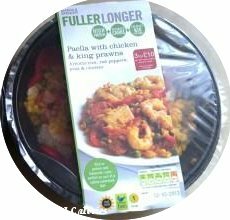 The M&S Fuller Longer range isn't specifically aimed at the calorie conscious - see the Count on Us label, they are nevertheless ideal for those watching their weight. 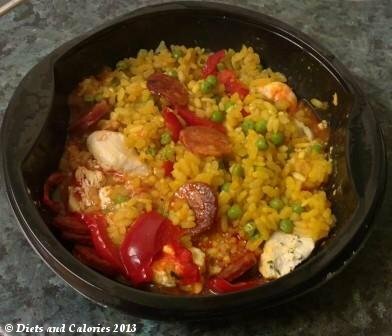 Paella with Chicken & King Prawns is made with Arborio rice, red pepper, peas and chorizo. It’s rich in protein with and is perfect to include as part of a calorie controlled diet. The whole 390g pack has 430 calories and is meant to serve one. This ready meal meal is particularly high in protein. It’s also low in fat, saturates and sugar and only just into the amber traffic light level for salt with 0.40g per 100g. The low level threshold is 0.30g. (See nutrition guide). This is a tasty, spicy and satisfying meal. I find it's too much for one person, probably because I always add extra veg. So dividing it into two made it just 215 calories per portion. It’s exceptionally filling because it has such a high protein content and a balanced amount of carbohydrates. There are lots of chicken pieces and several large chunky prawns with plenty of thin slices of chorizo. The whole pack is worth 1 of your 5 a day and is also included under the ‘Eat Well’ banner from Marks & Spencer. You can find this meal in the chiller cabinets of M&S food stores but it can be frozen. Nutrition Information per 390g meal: 430 calories, 35.1g protein, 41.0g carbohydrate, 2.7g sugars, 10.5g fat, 2.7g saturates, 10.1g fibre, 1.55g salt.